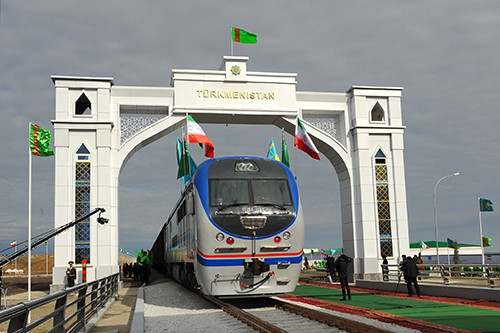 The railway and automobile bridges of Turkmenabat-Farab were put into operation, becoming a significant element of the country’s transport infrastructure, reviving the Great Silk Road in its new quality. Thus, the territory of Central Asia, step by step, becomes one of the most important transport and transit crossings of the continent. 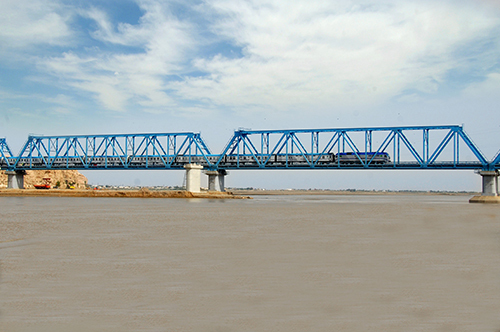 The railway bridge has a length of 1750 meters. This is Category I overpass with a width of 5.8 meters, it was built using the most advanced technologies in the world of bridge construction, adapted to the conditions of the Amu Darya with its strong current and other “whims”. The structures of increased seismic stability and operational strength with the calculation for super heavy freight trains were used. The height of the river shipping canal is 10 meters, the width is 60 meters. The bridge overhead structures, for preparation of which more than 9 thousand tons of super-strong metal was used, are supported by 18 impressive reinforced concrete pillars, of which 16 are built at various water depths, and 2 supporting structures on the banks of the river. Reinforced concrete piles with a diameter of 1.5 meters each made from the monolithic high-quality concrete and strong reinforcement structures evenly distribute the load to the support structures that enter the ground on the bottom of the river with a depth of more than 40 meters. To protect against abrasion by deposits within the river bed, the pile bodies are “clothed” in glass-polyester pipes, the total length of which is 6776 meters. In the upper part of the support structures there are bolts - linear bearing elements. To build 368 bored piles with a total length of 17664 meters and railroad bridge supporting structures, over 555,000 cubic meters of concrete was used. The whole complex of technological operations for corrosion protection of supports and spans, straightening and balancing of the upper structure of the tracks, including those on the access roads to the bridge, which in total make up to about 2 kilometres, was produced qualitatively. Alarm, communication and broadcasting systems, fire water supply, air duct have been installed. An operational site for maintenance personnel of this unique engineering structure was built. On both banks of the Amu Darya in the radius of the railway bridge a large complex of concrete bank protection works has been carried out. The length of the automobile bridge is 1600 meters, it is built downstream of the river, 450 meters from the railway bridge. The most modern designs and progressive technologies, which have no analogues in the Central Asian region, have found application here. In the project of the automobile bridge everything was considered - load capacity, speed of movement, use of all structures of increased strength, high seismic stability and other operational and technical characteristics. The bridge is designed to withstand the earthquakes of magnitude of 9 points on the Richter scale. A large complex of scientific and exploration, geophysical, geological, engineering and construction works has been completed. According to the bored technology, 17 powerful supports are constructed from high-quality concrete and reinforcement. On the supports, there are powerful bases for multi-tonnage steel bridge structures. To prevent the wear of the supports they are covered by glass-polyester pipes. The four-lane roadway of the bridge has a width of 21.5 meters. To ensure the safe movement of vehicles at the entrances to the bridge, ramps have been made with road junctions of 6 kilometres in length, which will allow vehicles moving and leaving the side roads to change the direction of travel without going to the oncoming lane. On both sides of the bridge there are pedestrian walkways with a width of 1.5 meters with metal fences. The pavement of the bridge consists of a state-of-the-art polymer material called matakril, characterized by high strength, durability, UV resistance and at the same time low thickness of layer and low weight compared to asphalt concrete. A significant factor is the fact that it will be possible to approach the left-bank side of the road bridge not only from Turkmenabat, but also along the new wide highway, laid from the nearby Serdarabat district. Via this road, without entering the administrative centre and loading the city streets, transit heavy trucks will follow the new Turkmenabat-Farab motorway bridge. The highest requirements to the quality of the structure and operational parameters are typical for all similar facilities in Turkmenistan, where large-scale programs are being implemented to develop all types of transport communications, including road transport, and large amount of work is being done to develop the road infrastructure. For a brief period of time - in 2009-2016 - only in Lebap velayat with the participation of President Gurbanguly Berdimuhamedov, modern highways of Atamurat-Kerkichi, Seidi-Eljik, and Atamurat-Kerkichi railway bridge with the length of 1,415 meters, 1,400 meters and 1,414 meters respectively, as well as the interstate railway Atamurat-Imamnazar-Akina with the length of 88 kilometres have been commissioned across Amu Darya River. The development of the transport infrastructure of Lebap velayat is associated with the industrial diversification of this region, one of the points of industrial growth of which is the Garlyk Mining and Processing Enterprise with a capacity of 1.4 million tons of potassium fertilizers per year. Its opening will take place very soon – on March 31st. To date, the total length of the railways of Turkmenistan has reached 5,113 kilometres. Of these, 1,755 kilometres were built during the years of independence. On all the steel routes of the country there are 742 bridges. One of the landmark projects implemented in recent years is the Kazakhstan-Turkmenistan-Iran railway line. The road opened on December 3rd, 2014, and became the golden link of the international transport corridor North-South, making the route from Europe to the Persian Gulf 600 kilometres shorter. The longest section of this 1,050-kilometer route runs through Turkmenistan - 825 kilometres. The total length of Turkmenistan’s motor roads is 13,737 kilometers, of which 6,540 kilometres are of national importance, and 2,280 kilometers are of international importance. Highways are built and reconstructed, bridges are built. The State Concern “Turkmenavtoyollary” is doing a lot of work in this direction. Thus, 31 bridges were erected on Turkmenbashi-Ashgabat highway in 2010. In 2014, 12 bridges were constructed on the Ashgabat-Mary highway, 62 bridges were commissioned on the section from Archman to Turkmenbashi. In 2015, from Mary to Turkmenabat - 28 bridges were constructed. The construction of new facilities continues. Among them - bypass roads around the cities of Tejen, Turkmenabat and Mary. The transport infrastructure of the Turkmen capital is actively developing, especially in the run-up to the 5th Asian Indoor and Martial Arts Games, which are a little more than 80 days away. The key object of the city’s transport infrastructure is the International Airport, the original appearance of which became the new visiting card of Ashgabat. In the northern part of the city there is an International passenger auto terminal, as well as the future highway to Turkmenbashi with a length of 562 kilometres. The width of his canvas with 6 lanes is 34.5 meters. In total, 12 overpasses and 217 reinforced concrete bridges will be built on the highway. Now this high-speed highway, launched in September 2014, is involving more than 1,000 specialists. The potential of the developing multimodal transport system of Turkmenistan is very high. North of the capital, through the Karakum desert, Ashgabat-Karakum-Dashoguz railway stretches for 540 kilometres, with a highway parallel to it. The implementation of large transport projects makes the idea of diversifying and optimizing the transport system on the Eurasian continent a reality, which will involve all new geographical spaces, economic and production centres, and will inevitably lead to an increase in business activity, the inflow of large investments, and the creation of jobs.